One of the triumphs of the recent ACC 2013 meeting was the the host city of San Francisco and the meeting venue, the Moscone Centre, which is central to downtown San Francisco and it’s associated attractions. One of the notable attractions is the San Francisco Museum of Modern Art (MoMA) right next door to Moscone. In a spare couple of hours during the meeting it was great to be able to call in there for some diversion. There I was delighted to find one of the replicas of Duchamp’s 1917 work ‘Fountain’ pictured above. If it looks like a urinal that’s because that is what it was. 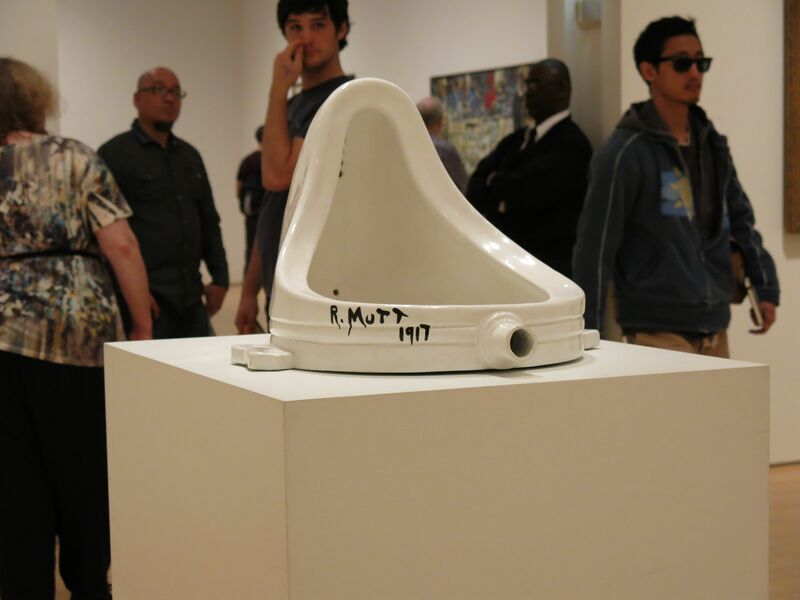 This is no ordinary urinal but one that in 2004 was voted one of the most influential modern art works of all time (and therefore possibly one of the most important works in the MoMA). Duchamp’s 1917 original was lost but celebrated by a series of replicas – this one, in the MoMA quietly celebrating the 50th anniversary of its creation in 1963. Unceremoniously placed on a non-descript, plain white plinth garners a level of inattention that I am sure the artist would perhaps have appreciated. I took the short movie below to illustrate this (you can see ‘Fountain’ centre frame on the white box). It was in no way my intention, but a matter of fact, that I didn’t attend any of the late breaking clinical trial sessions at the recent ACC meeting. In fact, I admit to taking at least 24 hours to figure out what an LBCT actually was (a new mode of cardiac imaging that had passed me by?). I enjoyed blogging some of the less travelled sessions of the meeting (Day 1, Day 2, Day 3). So I feel I did my bit for some of the things that don’t get the attention they deserve but for those in need of a good summary of the headline trials, that did garner most of the attention, here are a few suggestions. …and in a slightly different format a slideshow of the key findings of the major trials that were presented at the meeting. Myself and others have already commented on the strength of the poster sessions at the #ACC13 meeting which, by way of creative programming, were incredibly well attended on each day. So it was great to have the opportunity to present some of our latest troponin data alongside others such as James Jannuzi to a crowd that included Fred Apple and Alan Jaffe with the posters moderated by Kristin Newby & Harvey White. Where else would that happen? All of which seems to be quite an appropriate time to announce the launch of The Emergency Cardiology Group site which has gone live along with an associated Twitter feed @EmergCardioGrp. This is going to be a portal to all of the groups research and clinical redesign activities so please check it out. Thank you for registering to attend ACC.13, March 9-11 in San Francisco. Our records indicate that you signed up to participate in the 5K CardioSource Fun Run event, scheduled for Monday, March 11, 2013. We are writing to inform you that this event has been cancelled due to liability issues caused by the change in Daylight Savings Time while we are in San Francisco which has impacted our ability to effectively manage the run. We apologize for any inconvenience, and look forward to welcoming you to ACC.13. When I started blogging about a year ago I made the un-bold decision that I would keep by blog and the associate twitter account anonymous. It wasn’t a real attempt at anonymity and in fact has become a bit of a joke. The identity of @LastCardiology is one of the worst kept secrets amongst my peers! That being said, the decision not to link my name to the blog did have some basis. Firstly, I was at the time responsible for convening a large medical scientific meeting – probably the largest in the country in terms of attendance and budget. The meeting, its brand and its outcome – whilst a matter of great interest to me – really belong to the learned society of which I am a member. Consequently, whilst wanting to help promote the merits of the meeting I had no desire to use that as a cheap source of publicity for my own online activity and even less desire to see something that I might write have a negative impact on the outcome of the meeting. Secondly, I was at the time somewhat taken by the multitude of blogposts on the risks of social media to the practice medical professionals and being new to the game, it was not my desire to run the gauntlet of this potentially perilous activity. So almost a year on, with the meeting successfully out of the way and a considerably better feel for the risks and benefits of ‘the social media’ I was just about to lower my guard and formally blow the (laughably transparent) veil of anonymity away from my blog. ‘Preliminary Consultation Paper on Social Media Policy’ from the Australian Health Practitioner Regulation Authority (AHPRA). Above all, as a researcher as well as a clinician, I had begun to feel that the the social media had a compelling role in the future dissemination, promotion and integration of research activity. And there’s the rub. If as a clinician/researcher I am ‘out there’ promoting the merits of the clinical research of our group, cross blogging positive editorial comment, extolling the virtue of translating the findings of our work into daily clinical practice – will I fall foul of the law as interpreted by AHPRA? To me, the document appears uniformly negative, short-sighted, misguided and even somewhat paranoid. The sort of thing that one might have read in the tabloid press concerning the perils of the ‘information super highway’… about 15 years ago. I’d be most interested others comments and advice on this matter either here or through my blog at https://thelastgeneralcardiologist.wordpress.com but please be careful not to saying anything positive about me!